2. Launch "Command Prompt", enter "rendom /list". Using "rendom /list"﻿ generates the naming contexts in the forest into a file. 3. Enter "copy Domainlist.xml Domainlist-save.xml". 7. At "Command Prompt", enter "rendom /showforest". Using "rendom /showforest"﻿ reviews the new forest description in domainlist.xml. Using "rendom /upload"﻿ uploads the configuration of the domainlist.xml to the Domain Naming Master. All domain controllers in this forest have been initialized to the initial state. 10. Back to "Command Prompt"﻿, enter "notepad DNSRecords.txt". These DNS records are uploaded to the Domain Naming Master DNS server. 11. Close "DNSRecords.txt"﻿ and "dclist.xml". 12. At "Command Prompt", enter "adsiedit.msc". 13. Right-click "ADSI Edit", select "Connect to". 14. Next to "Select a well known Naming Context", select "Configuration". 15. Next to "Select or type a domain or server", type "dc1.contoso.com". 17. 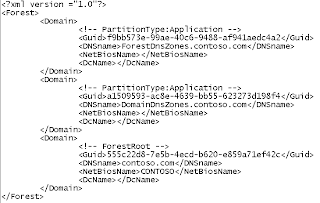 Expand "Configuration [DC1.contoso.com] > CN=Configuration,DC=Contoso,DC=com > CN=Partitions". 18. Right-click "CN=Partitions", select "Properties". 19. Select "msDS-UpdateScript", click "Edit". 20. Ensure the NTDSAscript opType="renamedomain". 23. Back to "Command Prompt", enter "Dsquery server -hasfsmo name". Remark: "Dsquery server -hasfsmo name" helps you to find the Domain Naming Master server. 24. Enter "repadmin /syncall /AedPq DC1". 25. Go to DC1, log in as Contoso Domain Administrator. 26. Click "Start > Run"﻿, enter "dnsmgmt.msc". 27. 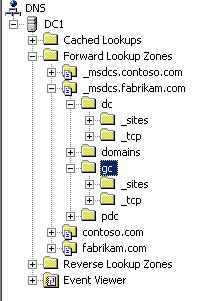 Expand "DC1 > Forward Lookup Zones > _msdcs.fabrikam.com". 28. Verify the "dc" and "gc" domain whether the domains were uploaded. 29. If the domains are not uploaded, perform step 30 - 33. 30. 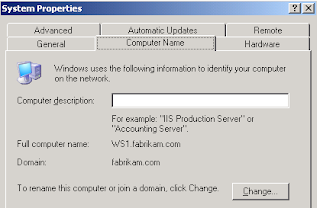 Right-click "_msdcs.fabrikam.com", select "New Domain". 31. Type "gc", click "OK". 32. Right-click "_msdcs.fabrikam.com", select "New Domain". 33. Type "dc", click "OK". The "_msdcs.fabrikam.com"﻿ will generate the sub-domains automatically. 34. Back to the "Command Prompt" of WS1, enter "rendom /prepare". Remark: Ensure the firewall isn't enabled when "rendom /prepare"﻿ is running. All domain controllers in this forest have been changed to the "Prepared" state. Remark: Ensure all domain controllers in "Prepared"﻿ state before running next step. 37. At "Command Prompt", enter "rendom /execute". 38. All domain controllers will reboot automatically. 39. Still in "Command Prompt"﻿, enter "notepad Dclist.xml". All domain controllers in this forest have been changed to the "Done"﻿ state. Remark: If, on the other hand, a fatal or irrecoverable error is encountered on a DC while attempting to execute the domain rename instructions, the corresponding state for the domain controller entry in the state file will be uploaded to read <State>Error</State>. For the Error state, the error code is written to the last error field <LastError></LastError> and a corresponding error message is written to the <FatalErrorMsg></FatalErrorMsg> field. If you determine that an error that has caused a DC to reach the Error state in the dclist.xml file is actually a recoverable error and you feel that forward progress cab be made on that DC by retrying the execution of the domain rename instructions, you can force the "rendom /execute" command to retry issuing the RPC to that DC (instead of skipping it) as described below. 1) In the "dclists.xml", locate the <Retry></Retry> field in the domain controller entry for the DC that you believe should be retried. 2) Edit the "dclist.xml" file such that the filed reads <Retry>yes</Retry> for that entry. 3) Type "rendom /execute" and press [Enter]. 40. After all domain controllers restart finished, at DC1, log in as Fabrikam Domain Administrator. 41. Launch "Command Prompt", enter "repadmin /syncall /AedP". 42. Enter "repadmin /syncall /Aed". 43. Restart the WS1 2 times. 44. At WS1, log in as Fabrikam Domain Administrator. 45. Click "Start", right-click "My Computer", select "Properties". 46. Select "Computer Name" tab, verify the Domain and Computer name. 48. Launch "Command Prompt", enter "xdr-fixup /s:Domainlist-save.xml /e:Domain;ist.xml /trace:Tracefile /changes:changescript.ldf /restore:restorescript.ldf"
Using "XDR-fixup"﻿ generates the files for updating Exchange configuration. 49. 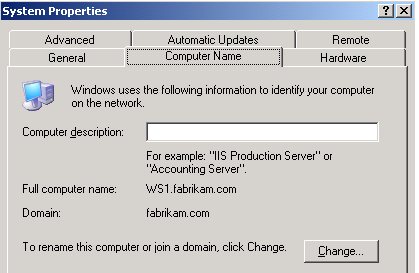 At WS1, immediately log off and log in as Fabrikam Domain Administrator. 50. Launch "Command Prompt", enter "ldifed -i -f changescript.ldf"
51. Restart all Exchange Servers 2 times. 52. Back to the "Command Prompt"﻿ of WS1, enter "rendom /end". 53. Enter "gpfixup /olddns:Contoso.com /newdns:fabrikam.com /oldnb:Contoso /newnb:fabrikam /dc:dc1.fabrikam.com 2>&1 > gpfixup.log. Remark: /dc:DcDnsName ﻿must be the PDC emulator of the domain controller. Remark: The command line parameters /oldnb and /newnb are only required if the NetBIOS name of the domain changed, otherwise, these parameters can be omitted from the command line for Gpfixup. 54. Enter "Repadmin /syncall /AedPq dc1.fabrikam.com dc=fabrikam,dc=com". 56. When all member servers and workstations restart finished, enter "rendom /clean". 57. Restart all domain controllers in this forest. 1. At DC1, log in as Fabrikam Domain Administrator. 2. 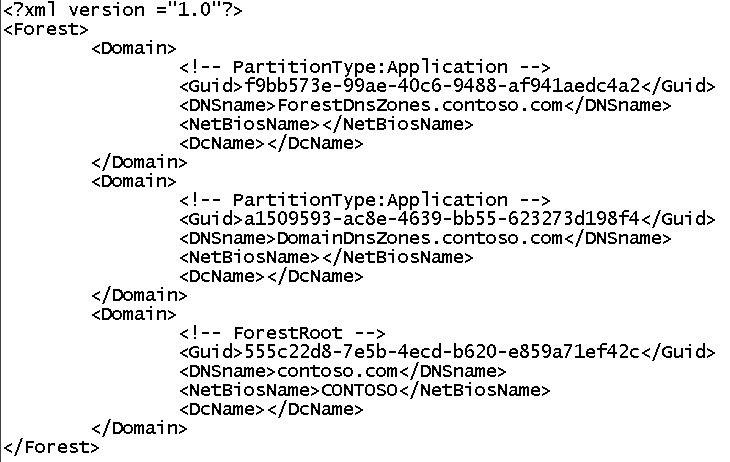 Launch "DNS Manager", expand "DC1 > Forward Lookup Zones". 3. Right-click "Contoso.com", select "Delete". 5. Right-click "_msdcs.contoso.com", select "Delete". 8. Click "Start", right-click "My Computer", select "Properties". 9. Select "Computer Name" tab, click "Change". 12. Next to "Primary DNS suffix of this computer"﻿, type "fabrikam.com". 13. Click "OK" four times. 14. 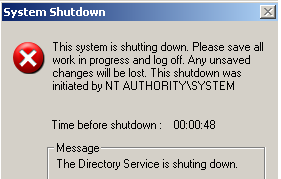 Restart the domain controller. 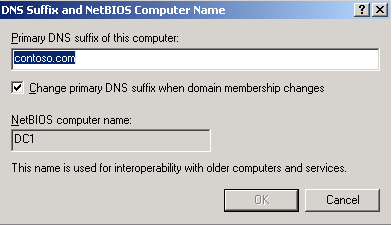 Remark: You may need to change the primary dns suffix in other domain controllers. 15. At DC1, log in as Domain Administrator. 17. Select "Remove this domain from the console"﻿, click "OK". 18. At "Group Policy Management Console", right-click "Group Policy Management", select "Add Forest". 19. Next to "Domain", type "fabrikam.com". 22. Right-click "DNS suffix rename", select "Delete". 24. Close "Group Policy Management Console". 25. Launch "ADSI Edit", expand "Domain [dc1.fabrikam.com] > DC=fabrikam,DC=com". 26. Right-click "DC=fabrikam,DC=com", select "Properties". 27. On the "Attribute Editor" tab, select "msDS-AllowedDNSSuffixes", click "Edit". 28. Remove the value "fabrikam.com", click "OK" twice.